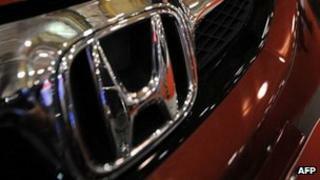 Honda Motors has said it will add a new car assembly line and build a new engine factory in China to cater for growing demand in the country. The Japanese carmaker says it plans to invest a total of 3.56bn yuan ($560m; £350m) to expand its operations. The new assembly line will have an initial capacity of 120,000 units per year, which will be doubled over time. The move comes as global carmakers have been looking to tap into the Chinese market, the biggest in the world. Honda said it would enhance its research and development capabilities in China "to further strengthen its operation to deliver new products which focus on Chinese customers". The new car assembly line is expected to become operational by 2014 and will increase Honda's total production capacity in China to 600,000 cars a year. China's economic growth in recent years has seen income levels rise in the country resulting in growing demand for cars. Faced with slowing growth in developed markets such at the US and eurozone, global carmakers have been keen to increase their presence in China, in an attempt to win a slice of the lucrative market. And they are leaving no stone unturned. On Monday, at the Beijing Motor Show, American manufacturers Ford and Chrysler unveiled models designed specifically for the Chinese market. Ford showcased a mini sports utility vehicle, which will be manufactured at Ford's main China factory in the southwestern city of Chongqing. Meanwhile, while Chrysler showed a dragon-themed Jeep. "To be successful in China, we must tailor our vehicles to the specific tastes of Chinese customers," said Mike Manley, Chrysler's chief operating officer for Asia. General Motors, which overtook Toyota as the world's biggest carmaker last year, said it kept the requirements of the Chinese consumers in mind while developing its cars. "The products that we are building today globally have a lot more attention paid to what the customer needs in China," said Kevin Wale, president of General Motors China unit.